These images were taken on June 30, 2015 at an aerobatics event hosted by the incredible members of the Team Oracle aerobatic flight team in partnership with the equally talented members of the John Klatt Airshows Team. Smoke from forest fires in Canada fills the air, leaving this lucky flier with some hazy memories of her flight with aerobatic performer John Klatt. The view from the Team Oracle photo ship, a Piper Seneca, piloted by Scott Steiner. 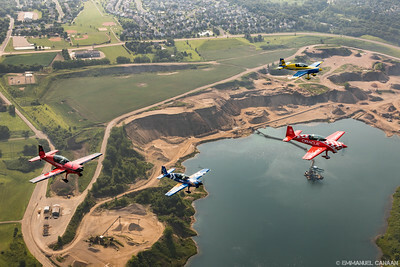 Aerobatic stars treat riders to a smooth formation flight as they pass over the Carver gravel pit in Carver, Minnesota. Seen here are Sean D. Tucker in the Oracle Extra, Chris Rudd in the Jack Link's Extra, John Klatt in the Air National Guard Extra, and Cameron Jaxheimer in the yellow, white, and blue Extra. Aerobatic stars treat riders to a smooth formation flight as they pass over farms southwest of Carver, Minnesota. Seen here are Sean D. Tucker in the Oracle Extra, Chris Rudd in the Jack Link's Extra, John Klatt in the Air National Guard Extra, and Cameron Jaxheimer in the yellow, white, and blue Extra. A lucky flier shows his appreciation for his memorable flight with Chris Rudd of Team Oracle who is seen here flying the Jack Link's aircraft owned by John Klatt Airshows. 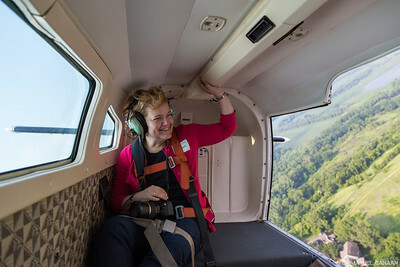 An Oracle customer will likely never forget her ride with upcoming aerobatic star, and Team Oracle member, Cameron Jaxheimer as they cruise over southern Minnesota. Smoke from forest fires in Canada obscures the ordinarily lush Minnesota landscape. Enjoying a playground typically reserved for angels, aerobatic pilots give four mere mortals a taste of the supernatural as they cruise serenely over Minnesota. 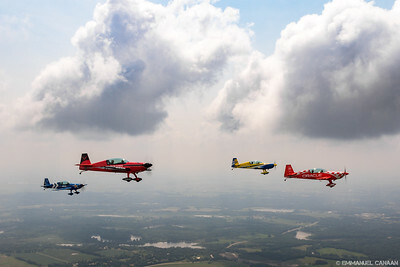 Seen here are Sean D. Tucker in the Oracle Extra, Chris Rudd in the Jack Link's Extra, Dell Coller in the Air National Guard Extra, and Cameron Jaxheimer in the yellow, white, and blue Extra as they give rides to Oracle customers over Minnesota. 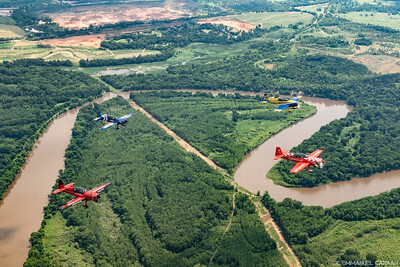 Multi-talented aviators fly a diamond formation as they pass by the site of the Minnesota Renaissance Festival in Shakopee, Minnesota. Seen here are Sean D. Tucker in the Oracle Extra, Chris Rudd in the Jack Link's Extra, Dell Coller in the Air National Guard Extra, and Cameron Jaxheimer in the yellow and blue Extra. Not pictured, is Scott Steiner of Team Oracle masterfully flying our photo ship. Visible just above and to the left of the yellow aircraft, is the site of the Minnesota Renaissance Festival. A lucky Oracle customer waves to the photo ship as he rides with aerobatic superstar Sean D. Tucker over Minnesota. 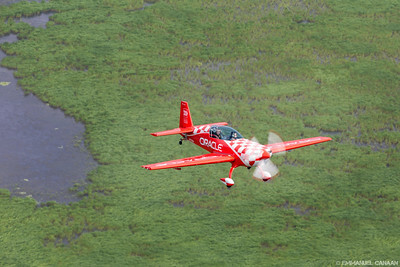 Chris Rudd of Team Oracle flies a passenger low over the Minnesota Valley National Wildlife refuge. He is seen here in the Jack Link's Extra 300 owned by John Klatt Airshows. 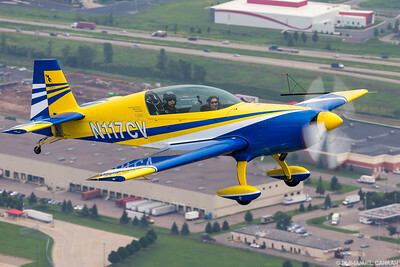 Aerobatic performer Cameron Jaxheimer flies a passenger low over Shakopee, MN, just east of Canterbury Park. Sean D. Tucker and Cameron Jaxheimer of Team Oracle fly low over the Minneapolis suburb of Shakopee, Minnesota. Visible in the image are Shakopee Area Catholic School, Shakopee Soccer Association, and Green Meadows Park. With aviators cut from the finest cloth, flying beautifully colored aircraft, this diamond is clearly one like no other. 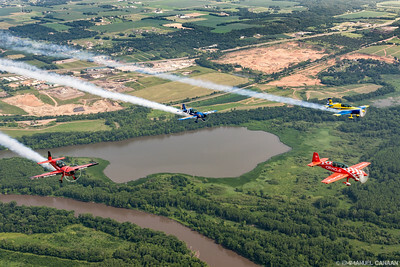 Seen here are Sean D. Tucker in the Oracle Extra, Chris Rudd in the Jack Link's Extra, Dell Coller in the Air National Guard Extra, and Cameron Jaxheimer in the yellow and blue Extra as they give rides to Oracle customers over Minnesota. Not pictured, is Scott Steiner of Team Oracle masterfully flying our photo ship. Visible just above the yellow aircraft is the site of the Minnesota Renaissance Festival. 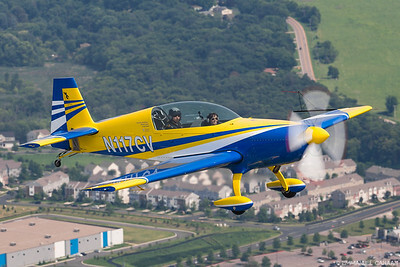 Aerobatic superstar Sean D. Tucker gives a ride to a very happy passenger over an industrial portion of Shakopee, Minnesota. A rider is all smiles as she flies with upcoming aerobatic star Cameron Jaxheimer. 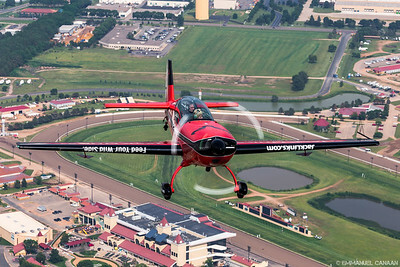 Chris Rudd of Team Oracle flies a young passenger over the Canterbury Park horse track in Shakopee, Minnesota. 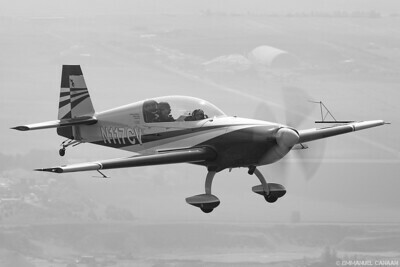 He is seen here flying the Jack Link's Extra 300 owned by John Klatt Airshows. 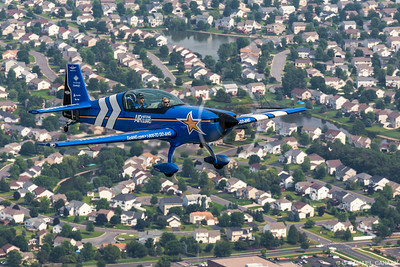 Dell Coller of John Klatt Airshows cruises low over suburban Shakopee, Minnesota. Chris Rudd of Team Oracle treats a young rider to a smooth ride over suburban Shakopee, Minnesota. He is seen here flying the Jack Link's Extra 300 owned by John Klatt Airshows. Aerobatic performers Sean D. Tucker and Cameron Jaxheimer follow the twists and turns of the Minnesota River as they prepare to treat their riders to some aerobatic twists and turns. It's smoke on for this three ship formation of aerobatic masters as they rocket away to do some aerobatic maneuvers over Minnesota. Seen here are Sean D. Tucker in the Oracle Extra, Chris Rudd in the Air National Guard Extra, and Cameron Jaxheimer in the yellow, white, and blue Extra. A passenger smiles with glee as Sean D. Tucker climbs over Shakopee, Minnesota in preparation for some serious aerobatic maneuvers. Chris Rudd of Team Oracle borrows John Klatt's Air National Guard Extra 300 to give a lucky flier the ride of his life. 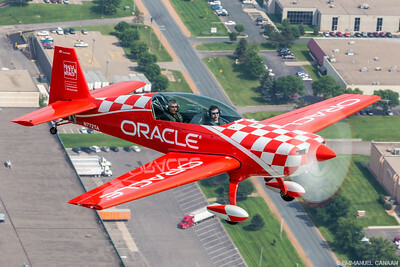 Sean D. Tucker and Cameron Jaxheimer of Team Oracle fly low over the Minneapolis suburb of Shakopee, Minnesota. Visible in the image are Shakopee Area Catholic School, Shakopee Soccer Association, and Green Meadows Park.